Today was a luxuriously glorious day. The kind of day you are afraid will never return. It was sunny, hot, but not too hot, and the kids slept in. That meant there was nothing to do but make pancakes for breakfast and head out for the day. Well, after I ate a whole bunch of the first crop of BC strawberries too. So we loaded up the Chariot, got on the bike, packed some cherries, and went on a little adventure with the girls. 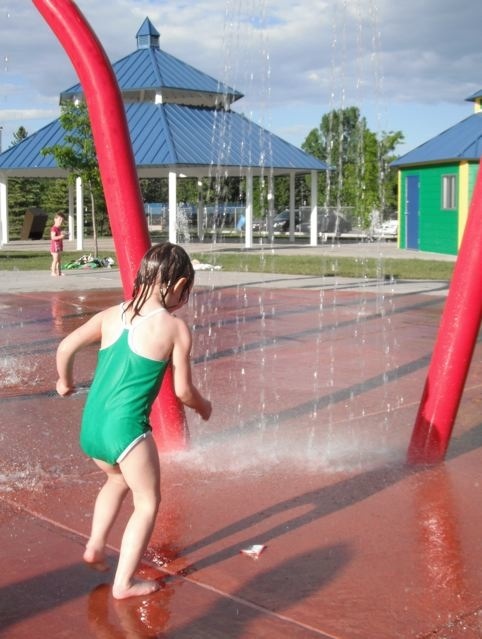 It was perfectly suburban, finding a hidden playground in a chi chi neighbourhood, enjoying sandwiches at Heritage Park, and taking a ride along the Glenmore Reservoir. That left a picnic as really the only dinner option. A picnic at the Splash park no less. Of course, that meant the girls ate very little in the midst of playing. That just means pancakes for breakfast again tomorrow morning. On the menu tonight was some souvklaki I made during naptime. Garlic, lemon juice, olive oil, along with with some fresh oregano, mint, and rosemary took their own nap with with chicken and pork. We grilled it just before we left for the park. Wrapped in foil it was still warm when we arrived. 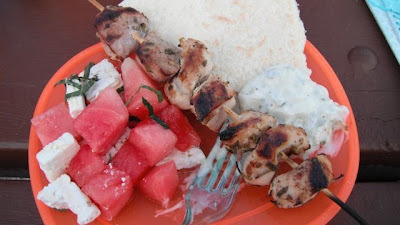 We also ate some Gull Valley tomatoes and cucumbers, pita bread, tzatsiki, and a side salad of watermelon and feta. I haven't had that salad since last summer, boy have I missed it. Cut your watermelon in chunks. Toss with about a third as much feta. Top with some chopped fresh mint, freshly ground pepper, and a drizzle of olive oil. To be honest, I think the original recipe comes from a Nigella Lawson book, but she may have included olives as well. We aren't olive fans in this house. So we unloaded at the park, set the girls to running around, and chowed down. I even had an interesting conversation with a man at the next table over, but I could have done without stories about war in Lebanon in the 70s. That's the risk you take for taking Sunday dinner away from the dining room table. A small price to pay to cap off this beautiful day. My house has smelled like a chai latte for the last two nights. I go to sleep with ginger and cardamom wafting through our tiny, crowded house. Not a bad smell to fall asleep to when your bed has been empty for two weeks. Hubby is arriving home just in time for the Food Blogger Bake Sale as part of the Market Collective this Saturday. 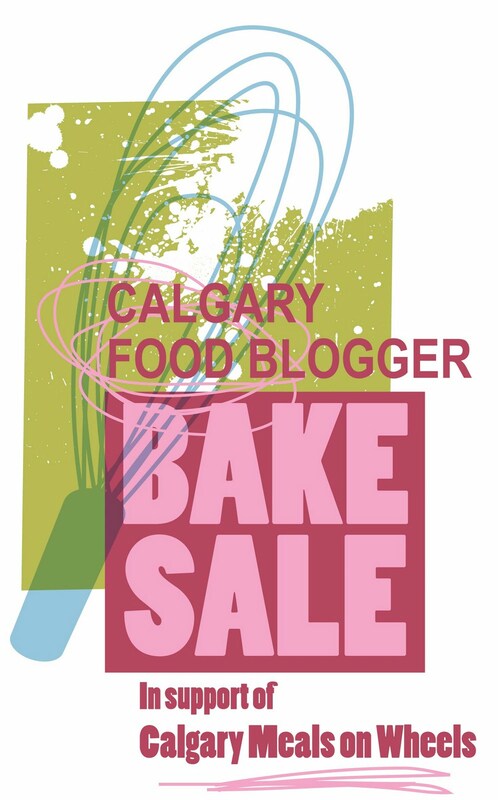 A huge line-up of Calgary and area based food bloggers are uniting to sell their donated treats all in support of Calgary Meals on Wheels. To be perfectly honest, I had no idea there were this many local bloggers! And this isn't even a complete list. There will be a range of delicious treats. Vegan treats, gluten free treats, delicious treats, and plain old decadent treats. 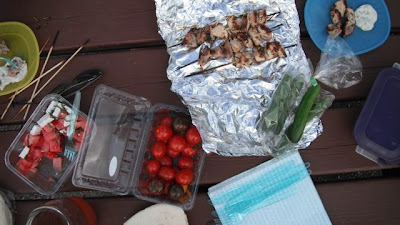 A giant thank-you to Vincci at Ceci N'est pas un Food Blog for wrangling us. This bake sale is why my house smells so yummy. 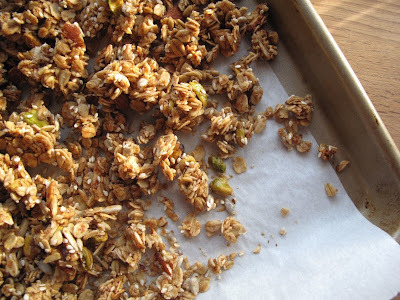 My contribution is my Chai Spiced Granola (With Pistachios and Almonds). If you have the Blog Aid:Haiti book you've seen it. Vincci has made it, as has Aimee. So, if you want to try it, you could make it yourself. Or, you could come down to the Market Collective (148-10th Street NW - the old Ant Hill Fabrics building) and pick up a bag. And if you come first thing on Saturday morning I'll be there too. 1. Preheat oven to 300 degrees F. Prepare two large cookie sheets with parchment paper or non-stick spray. 2. Mix together the honey, sugar, water, oil, and spices in a small saucepan. Heat until sugar is dissolved, stirring occasionally. It's okay if it comes to a boil, but don't leave it there. 3. Stir together dry ingredients. Add wet ingredients to dry. Mix together well. Split between the two cookiesheets. 4. Bake at 300 degrees F for 15 minutes. Reduce heat to 275 degrees F and rotate pans. Bake another 15 minutes. Turn off the oven and leave to cool completely. You might not consider it a downfall, but one of the downfalls of freelance food writing is developing stories totally out of season. Today I made a spider cake for Halloween, sugar cookies, meringue cookies, and hot cocoa with marshmallows. On at +25C day. Good times. In truth, dinner was a plain old cheese quesadilla and a handful for cherry tomatoes to soak up the sugar. Despite all those cookies though, I reserved a few of these for a post-the-girls-finally-fell-asleep-and-I'm-exhausted-after-two-weeks-of-single-parenting chocolate chip cookie snack. These are the first things I ever learned how to make. I may have been about 9. My mom worked fulltime and we three kids were competitive swimmers. Food was about fuel - how much could we get in at any one point, how much could mom buy and cook to hopefully get us through the week. Fed up with purchased cookies I asked if I could make cookies myself. No clue who found the recipe or where it came from. But I was left alone in the kitchen. I found the entire experience both comforting and empowering. Woohoo, I was in the kitchen and left to my devices! There was butter and chocolate involved. It was the start of something great. From that point on these were my go-to cookies. My go-to sleepover cookies. My go-to watch TV in the rumpus room cookies. My go-to console a friend whose boyfriend dumped her cookies. My go-to chick-flick cookies. My go-to rainy day and single parenting cookies. At 35 I have to find people to share these with - I do not need a cup of butter to myself. Thank goodness my kids are happy to help me with that. Now they've become my go-to get in the kitchen and bake with the girls cookies. 1. Preheat oven to 350 degrees F. Grease a 9 x 13 pan. 2. Cream butter and sugar. Add vanilla. 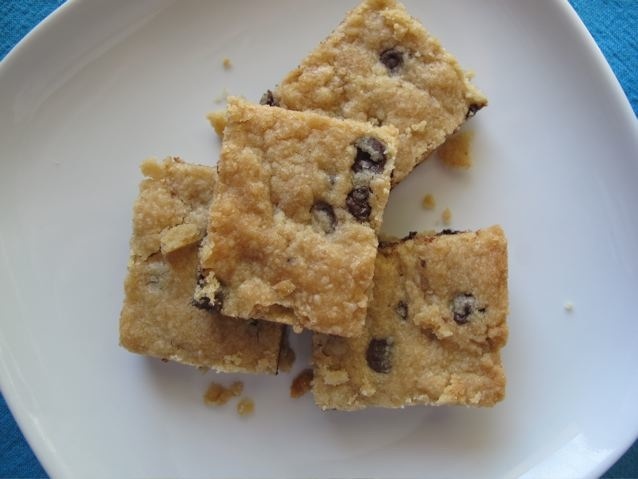 Stir in flour and chocolate chips. Press dough in pan. 3. Bake 2-25 minutes until lightly browned. Cool slightly, but cut when still a bit warm. Cool some more before you dig in. Taking advantage of the sale at our favourite liquor store led to Sunday dinner this week. One could also argue that the near constant desire for a lollipop by The Monster and her knowledge that they have them at the same liquor store also led to Sunday dinner. Regardless. We shopped, we cooked, we ate. Tasting a lovely wine yesterday (Walter Hansel Cahill lane Vineyard Chardonnay 2007) I was instantly brought back to our trip to Mexico. It wasn't that the wine reminded me of the cheap imports we got at the supermercado, rather, it was the instant pairing that popped in my head. I immediately though fish, peppers, and a bit of spice. Sadly it was too late to get some fish for dinner last night, so we picked some up at the market today. And peppers, tomatoes, garlic, and some lime. Sadly I forgot the cilantro. Oh well, it still worked. I finely chopped sweet peppers, tomatoes, garlic and tossed them with a splash of olive oil, tequila, and a half a lime, juiced. We served it with a quickly seared Opah. A bit of chili powder and cumin to season, and a few minutes per side. It would have been better grilled, as we did in Mexico (although it wasn't Sierra Mackerel), but my grill is currently inaccessible. 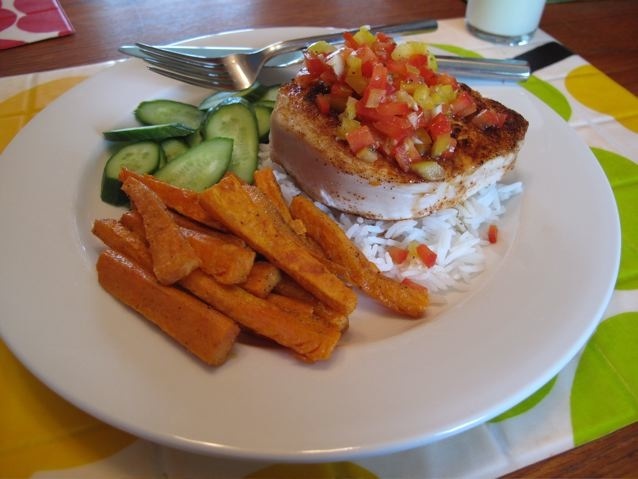 On the side some sliced cukes, basmati, and sweet potatoes roasted with cumin and lime. And in case you were wondering, I did not enjoy it with the wine. One, it is an expensive wine, and two, I'm home alone with the girls so the last thing I need is a full bottle of wine to myself. Or maybe that's exactly what I need! Today it is all about my Nanny. And in two weeks it will still be all about my Nanny. It may come as a big surprise to you, but I am not so independently wealthy that I get to do nothing but make ice cream and write blog posts. I only wish. Alas, I am in the office 4 days a week, freelancing and teaching on the side, and oh yeah, raising my two little ones. I could not do any of this without my Hubby, of course. And none of it would be possible without our Nanny. Emily watches the girls while I'm at the office. She is outside with them everyday, regardless of the weather, she brings them treats like ice cream bubbles, she cleans the house (even taking out the garbage), and most importantly to me, she bakes. Not only am I happy that my girls get even more time in the kitchen, but it is glorious to come home at the end of the day and have fresh cookies waiting for you. The two most used cookbooks for cookie recipes are good ol' Martha and, more frequently, Julie's One Smart Cookie. 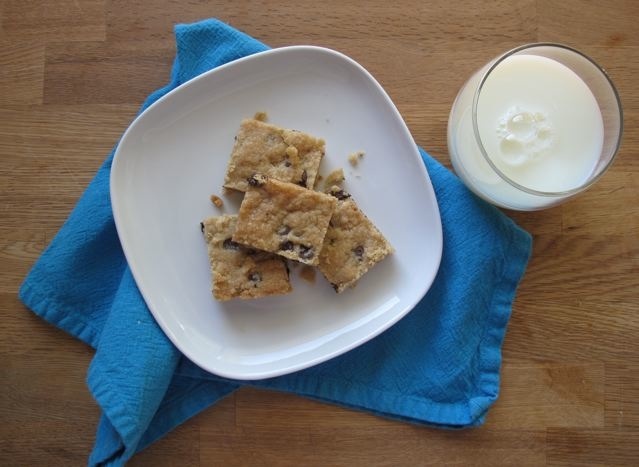 The girls are never afraid to try a new recipe, despite The Monster's usual request to bake chocolate chip anything. When I came home the other day though, these raisin cookies greeted me at the door. My first question was which book they came from? No book, it was Grandma's recipe. And Emily has made it so many times she has it memorized. She graciously allowed me to share it here. 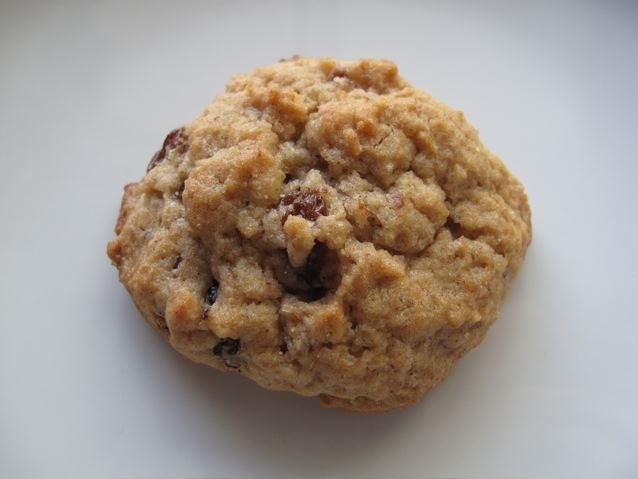 To be honest, I'd never thought I would obsess over raisin cookies. But these are moist, sweet, and chewy, with a hint of spice. A chocolate chip fan myself, I can safely say these are one of the best cookies I've ever had. Thank-you Emily, and thank-you Emily's Grandma. 2. In a small sauce pan boil water and raisins together for 5 minutes. Cool slightly and stir in baking soda. Set aside. 3. Cream together butter and sugar. Add in eggs and vanilla. Combine well. Stir in raisins then add in dry ingredients. 4. 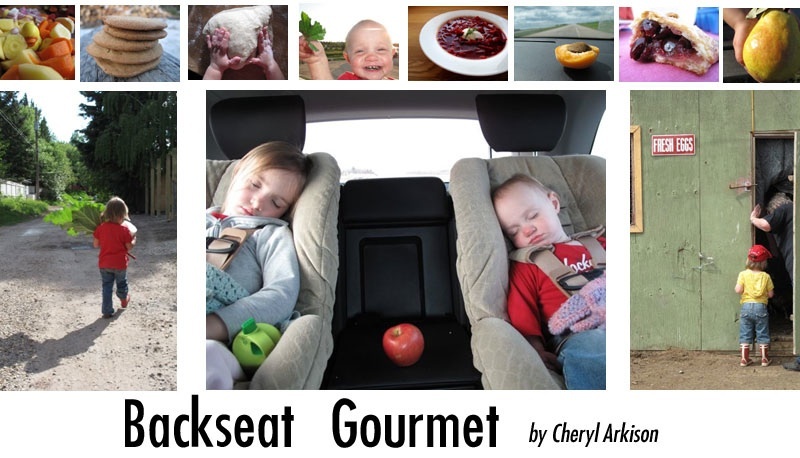 Drop by teaspoonfuls on a greased cookie sheet. Bake 12-15 minutes.